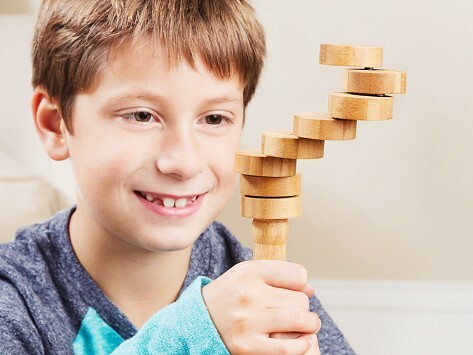 This travel-sized balance toy was created as a rehabilitative tool to help hone fine motor skills—and it does it in the most fun and challenging way. The objective? Neatly stack the disks. That might sound simple, but it takes concentration and coordination to get the unpredictable, rotating magnetic bamboo discs to line up just right. Dimensions: 1" x 1" x 9"
Bought this for a Christmas gift. I start my shopping early, very early. Almost got one for myself. I bought this for my grandsons and they just love it. The TrueBalance balance toy practically begs you to pick it up. Once we did, we didn’t want to put it down. The handheld toy-meets-brain teaser is made to work on fine motor skills and it is endlessly fun. The objective of the toy is to get the rotating magnetic discs to stack up. Sounds easy, but as we learned, it's not—which makes playing with it so engaging. The toy’s movements are unpredictable, so you have to react quickly. Kids and grown-ups alike rely on hand-eye coordination, concentration, problem solving skills, and, yes, balance, to get the discs to line up. Henrik Deterberg and his daughter Linea invented TrueBalance as a rehabilitative tool for folks recovering from brain injuries and strokes. While it did the job of working fine motor skills, the Deterberg’s learned others were simply playing with it for fun. Pick one up and we think you’ll agree this toy is one the whole family will want to get their hands on.